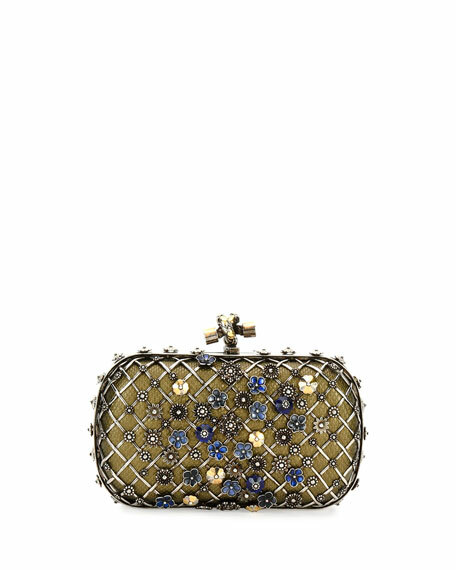 Bottega Veneta snakeskin clutch bag with metal lattice and floral appliqué. Framed hard-shell body with rounded corners. 4"H x 7"W x 2"D.
EXCLUSIVELY AT NEIMAN MARCUS Casa Isota leaf-embroidered cotton clutch bag with suede trim. Flap top with self-tie tassel center; snap closure. Interior, one zip pocket. 7.1"H x 12.2"W x 1.2"D. "Barbara" is made in Italy. 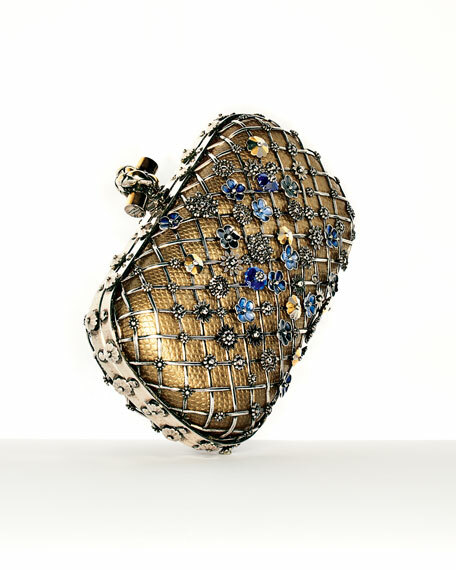 EXCLUSIVELY AT NEIMAN MARCUS Gedebe "Mini Cliky" printed leather clutch bag with golden hardware. Chain shoulder strap, 20" drop. Flap top with engraved logo detail; snap closure. Exterior, jeweled appliqué embellishments. Interior, suede lining. 5"H x 8"W x 2"D. Made in Italy. Hayward mini bag in painted python snakeskin with golden chain accent. Top handles, 8" drop. Open top with center magnetic flap. Interior, suede lining. 9"H x 6.3"W x 4.5"D. Made in USA of imported material. Python cannot be sold or shipped to California. 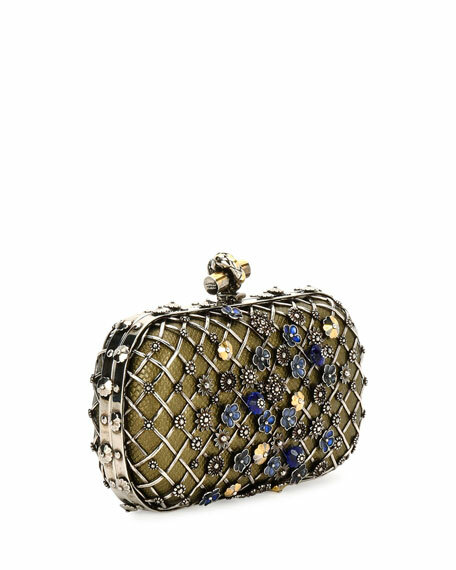 Hayward mini bag in python snakeskin with silvertone chain accent. Top handles, 8" drop. Open top with center magnetic flap. Hayward mini bag in python snakeskin with silvertone chain accent. Top handles, 8" drop. Open top with center magnetic flap. Interior, suede lining. 9"H x 6.3"W x 4.5"D. Made in USA of imported material. Python cannot be sold or shipped to California.